When I was a little girl I was a cookie lover. 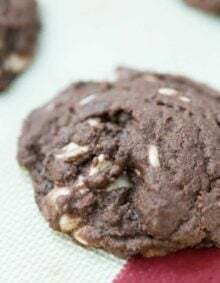 Quite a few of my very first memories involve being in the kitchen with Dad to make oatmeal raisin chocolate chip cookies and with Mom to make Halloween sugar cookies. Which is funny because I never really liked those sugar cookies. I remember Mom rolling out that soft, delicious dough (the dough was yummers, it was the baked cookie that lost its appeal to me) and me stamping out as many spooky shapes as I could. But those things are fading because as I get older I’m finding that I enjoy a slice of pie more and more. Especially this homemade apple pie. One of my favorite pies seems to be the one that people have the most complaints about. In fact if you read about Cade’s apple pie you’ll learn that my mom HATED apple pie which is why I don’t have a recipe from her. But that seems to be common, a lot of people don’t like apple pie while others adore it. I’m an adorer. ADORER? Is that even a word? But my apple pie MUST have a few things perfect. The crust. Don’t give me a pie with a totally soggy or blackened crust. Gag. I hate that. The crust is one of the best parts about pie so it had better be flaky and good. Then there’s the apples. I like them perfectly cooked so they aren’t terribly crunchy or pure applesauce with pie filling goo all over them. And then my girlfriend, Sarah introduced me to her mom’s pie. It’s like a dreamland filled with unicorns, rainbows and flowers. Or at least that’s what my 6 year old self would have imagined to be magical. The crust is so easy and made with oil which gives it the perfect flakiness. The apples are golden delicious which I know, you’re used to being told to use a mix or straight granny’s, but I agree these give it the perfect sweetness. Sarah is totally like this pie. Oh, oh yes I’m going there. Are you really very surprised that I’m comparing a person to food? She is though, she’s perfectly genuine and sweet and so easy to get along with. Sometimes I’m pretty darn sure that we were meant to cross paths as she has been such an amazing friend. One that you can get deep with or just laugh about silly things like chubby babies dancing. In fact, I think we must secretly be the same person because we live a pretty darn similar life. Which is fine by me. I would want to be like her since she has so much to teach about compassion, mothering, living up to who you are meant to be and so much more. We are praying so hard that their dream of adoption comes true and in the meantime I think I’ll eat a little more of her pie, a recipe I’ll keep forever and one day teach my children to make while reminiscing about this sweet dancer that became a dear friend. And if you haven’t already, head back to yesterday’s post where she gets brave and tells us about their struggle with infertility and why she needs your help. 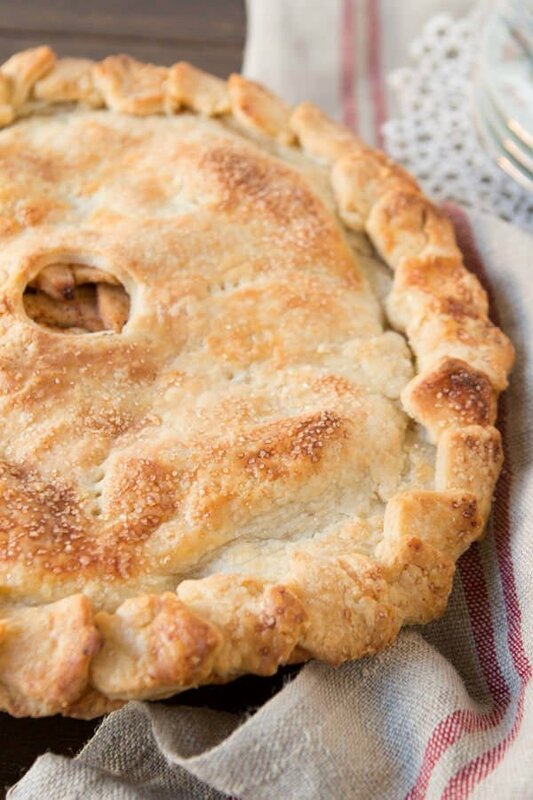 Can You Freeze Apple Pie Before Baking? You can freeze apple pie before or after baking. To freeze before baking, wrap tightly with foil or place in a heavy duty freezer bag and freeze. How Do You Bake A Frozen Pie? Place frozen pie on foil lined cookie sheet to catch any run over from juice. Cook at 400 degrees for 30 minutes and then reduce heat to 350 degrees for approximately 35-45 minutes. How Long Will Apple Pie Keep? 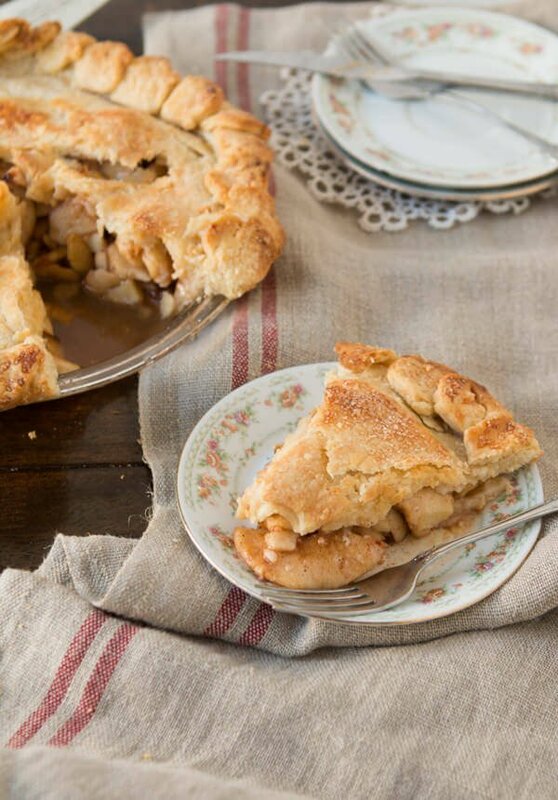 You can keep baked apple pies at room temperature for up to two days. 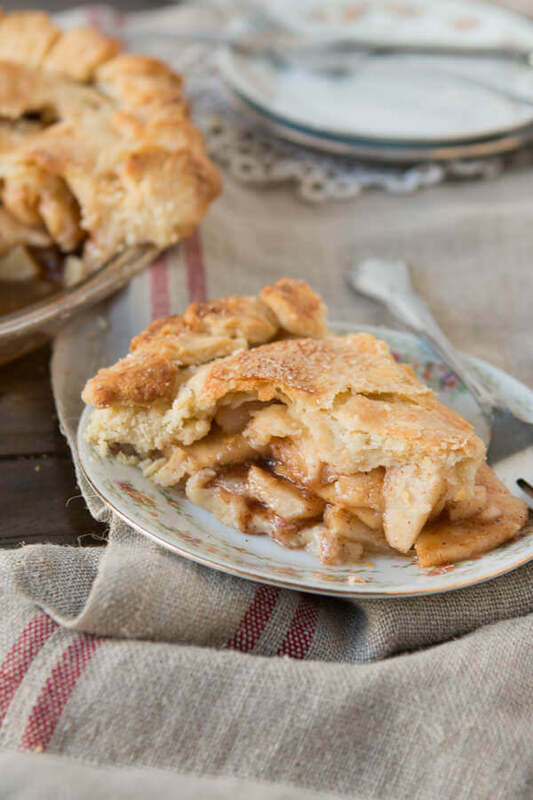 Apple pie can be kept in the refrigerator for up to 5 days. Stir flour mixture while pouring oil with a fork. Sprinkle water over dough (sometimes I have to add less than 2 Tablespoons–so I add just one at a time). Knead with hands until just incorporated. If mixture is to dry add a little more oil, but just barely. Separate into 2 discs and wrap tightly with saran wrap. Allow to rest in the fridge for 1 hour or up to 1 day. Allow to sit out for 5 minutes, then sprinkle the counter with flour and dust the top of the dough. Roll out one disc at a time pushing from the center out, turning a 1/4 turn after every roll until you’ve completed a smooth pie crust. Gently fold in half and then in half the other way and lay in a pie pan. Lift the edges and press down into the pan so you aren’t stretching the dough. Prick the bottom and sides with a fork. Repeat with remaining dough and keep between 2 plastic sheets, and plastic over the pie dough in the pan and keep chilled while you start the apples. Place the apples, sugar and cinnamon in a large bowl and toss to coat. Pour into the pie pan, top with butter and the 2nd pie dough sheet. Cut out vents or whatever design you want. Bake for 40 minutes checking and tenting the edges with foil after 20 minutes. Allow to rest for a few hours before slicing. Golden delicious are softer apples but they are sweeter than granny’s so we prefer them. You may substitute if you prefer a tart pie. That apple pie looks absolutely fantastic. Beautiful photos, too. I look forward to trying this. 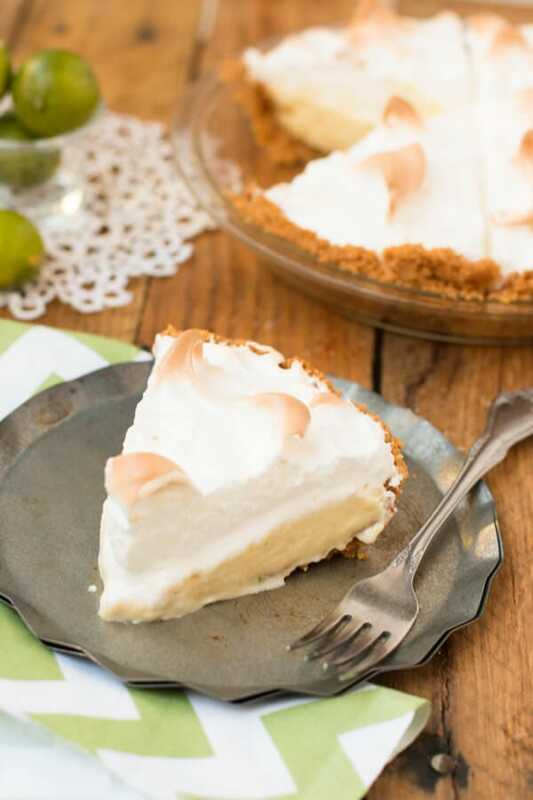 Could this pie be made a day ahead? How well will it keep and reheat? Yes, it can definitely be made a day ahead! I like to just zap individual slices in the microwave for those that want it warm. If you want to warm up the whole pie, cover it in foil and stick it in the oven at 250 until it is warm. The colors are so vibrant and your photography is fantastic! 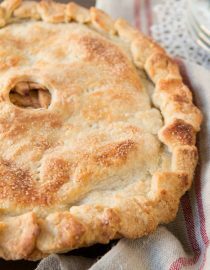 Thx for sharing apple pie recipe, I definitely add it to my cookbook! Thank you so much, Robin! Enjoy!! 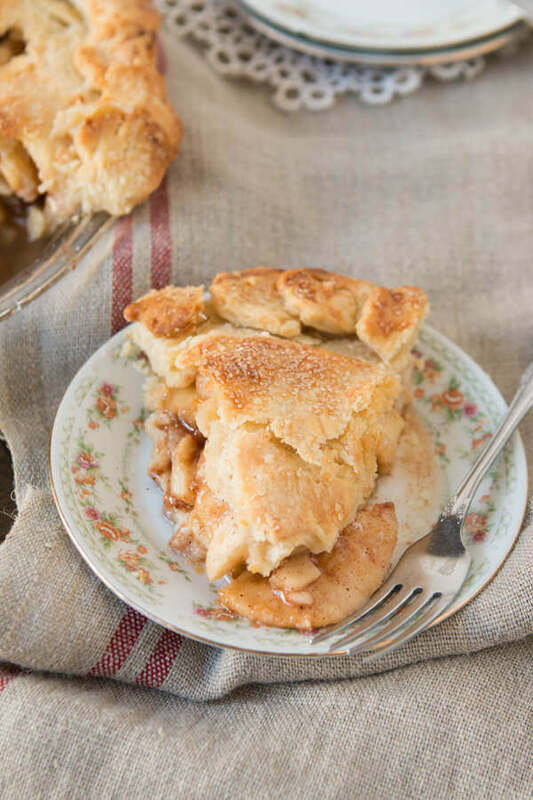 I had a similar apple pie at a restaurant recently and found myself craving it and wondering if I could recreate it today. Happy Independence Day! 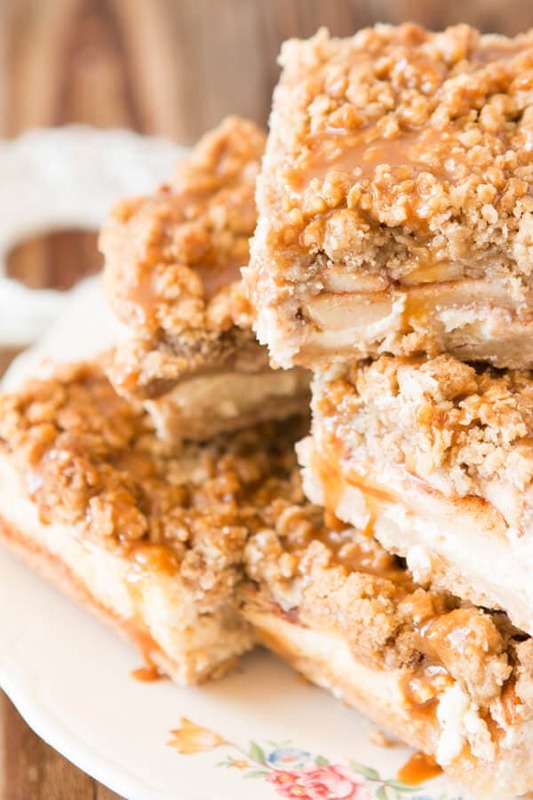 Awesomeness apple pie recipe. 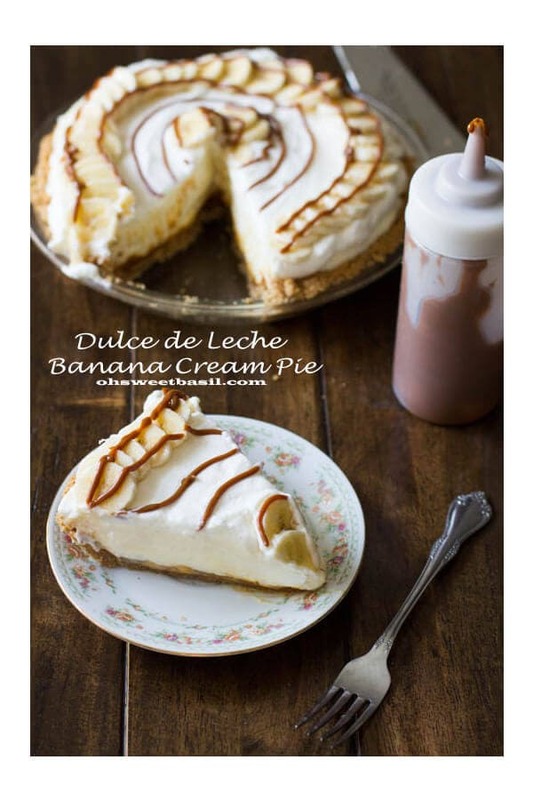 What a fabulous recipe and bloggers feature! This pie is killin’ me. Thanks for sharing guys! 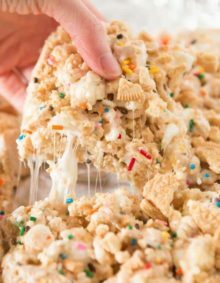 I’m planning on making this for Thanksgiving along with your pumpkin pie and no bake banana pudding cheesecake. Will this crust work for your pumpkin pie as well? I’m sorry that happened. Without being there I’m not sure what happened. One thing that is easy to have occur in baking is the flour measurement as some are lighter handed while others are heavier so I’m assuming we just measure differently. In studies they’ve shown that people often have 1/3 cup difference when measuring flour! Crazy! It could also be that it wasn’t rolled out thin enough. I’m sorry, I wish I had been there so I could help! Oh good!! I’m so thrilled! Looks divine!! This might be a dumb question, but what kind of oil do you use in the crust? You’re so right about apple pie! I’m an adorer too! I love apple pie but I like my apples a bit crunchy (sorry!) 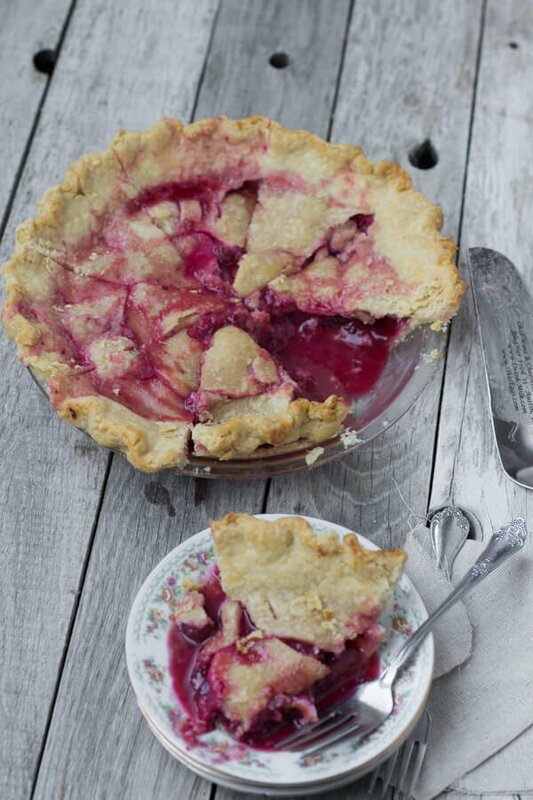 I love how your crust looks super super flaky in these pictures, it’s amazing! I’ve never made pie crust with oil before, this is the first time I’ve even heard of this, always butter or butter/shortening for me. Something new to try! It’s such a different recipe. The apples are different and the crust but it is awesome! Apple pie is my VERY favorite. This looks fantastic! There is nothing like homemade apple pie! That crust looks amazing. Pinning! Oh, don’t tease! I would love it! Apple pie is my absolute favorite! This one looks perfect! The crust is everything to me and yours looks beyond good! And yes making cookies can be fun. I still love making them and pies too 🙂 I’ll take both! “…chubby babies dancing”–Seriously made me laugh out loud!! Nothing brings people closer than chubby babies dancing. Thanks for the wonderful compliments. Luckily, I can honestly say them back about you! 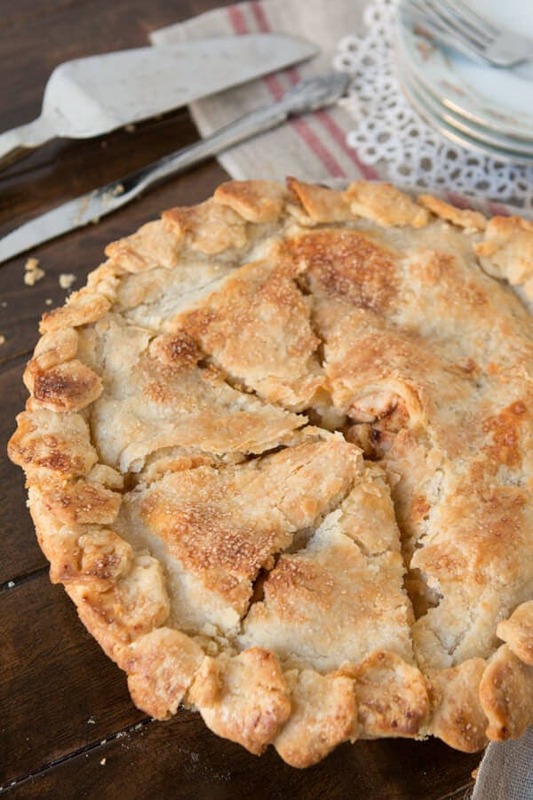 As for the pie…I have converted non-believers to apple pie because of this recipe. It is that good! I believe it! We even tried to fall in love with that other crust, but if it doesn’t turn out the same every time it’s clearly an imposter! 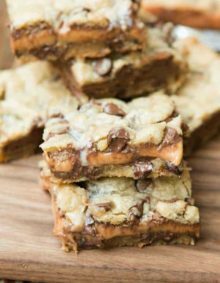 Love this recipe and your sweet fam. I am an adorer of apple pie as well! However not the best baker, does letting the dough firm up ensure its flaky? I’m a total ADORER too 🙂 There’s nothing better than a slice of classic apple pie and a scoop of vanilla ice cream…yum! It just screams at home comfort doesn’t it?